Green Pet Products proudly introduces the PureLite™ Process. Until now, natural-based litters and bedding products contained a numbers of different microbes, molds and spores, some of which could be a health risk to your pets. PureLite™ is a special process that breaks down the microbiological content and mold-forming agents commonly found in organic litter. This process was developed by Green Pet Products for use in its cob-based litter products after extensive research, development and testing. This special process sanitizes a pet’s litter by destroying the mold spores in litter —providing a cleaner, fresher and healthier environment for your pet’s home. 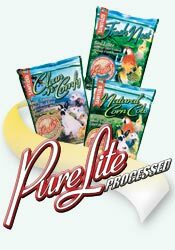 Clean-N-Comfy®, Natural Corn Cobs and Fresh Nest® litter and bedding.